The consistent slaughter rate of the large-framed, heavyweight Australian Whites was a marketable selling point for Bruce and Jannie Hodgson from Darlington who, in the last year, have transitioned their composite ewe flock to focus on commercial whites. Sourced from the foundation stud at Tattykeel (Oberon, New South Wales), Ardene Australian Whites Stud at Darlington was established early last year and runs across the 1230 hectare sheep and mixed cropping enterprise. 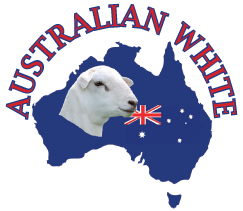 "We got interested in the Australian Whites for the carcass quality, shedding ability and ease of handling," Bruce said. Developed from White Dorper, Van Rooey, Poll Dorset and Texel genetics as a haired shedding meat sheep, mature ewes average 60 to 70 kg. The Hodgsons have clear bjectives and hopes to continually develop the breed as a self replacing flock, as well as supply rams to prime lamb producers to increase growth weights in crossbred lambs. Last November, single lambs averaged 26.4 kg per head, while twin lambs averaged 22.5 kg carcass weight, which is sold directly to Coles. "Our ideal slaughter weight is 22 to 24 kg, so a July drop lamb is hinting that by mid-to late November is ideal." With two lambing season's experience, the breed has exhibited hardiness, do-ability, carcass weight and shape-on-par with the Ardene Australian whites goals. "They are small lambs and birth with rapid growth, so they get good, heavy lamb at the early age," Bruce said. The Hodgsons expect strong interest from prime lamb producers at the Australian Sheep and Wool Show at Bendigo as the Australian Whites have excellent temperment compared to some other shedding breeds. Quiet temperament is essential not only for management but improved eating quality. Other important traits includes soundness, and high vigour in lambs. "It's a breed that is suitable to all different terrains and environments in Australia, that does not run to fat in good conditions," Bruce said. "The eating quality is also superb, I might be biased but it's the best lamb I've ever eaten." Bruce said the move to Australian Whites stremmed from poor wool prices. He believes the money is in the lambs, not the wool as the world needs protein. Commercial ewes are joined on Australia Day each year, at 1.5 rams per hundred ewes, with average scanning rates of about 170%. The Hodgsons' lambing program aims to coincide with spring feed, maximise growth weight with minimal extra input before selling. The flock runs on improved pastures with supplementary feeding at the moment due to the late break.